Well, hello! Let’s pick up where we left off, shall we? As I recall, we were enjoying lots of good food and the people we love and life in general, and then I went on a very long vacation. I hope you did too, or that you stayed home and snuggled your family and drank hot chocolate, and that either way you’ve had a restful and happy end of one year and beginning of the next. So happy new year! I wish you a year of good health and simple pleasures. And what, after all, is as healthy and simple as an egg? I think of the egg as a secret weapon in my kitchen: it cooks in seconds, it’s cheap and filling, it makes leftovers into a meal. And I owe another debt of gratitude to the egg: it’s the thing that got me started writing this blog a year ago today, in an effort to branch out from my cooking regimen of scrambled eggs and scrambled eggs. I’ve managed to diversify a bit this year, it’s true, but there’s still always room for a good egg in my kitchen. Boiling an egg is an economical preparation: the shell holds it tidily, no added fat is required, and you needn’t even exert your wrist with whisking. You only need water, a pot, a few minutes of patience and, preferably, a pinch of salt at the end. You can leave the yolks soft to smear over toast or cook them through to creamy perfection for a composed salad. I’ve tried all kinds of tricks for peeling eggs more easily, but I’ve never been wowed by any of them. I think I have the best luck running the hot eggs under cold water as I peel them–what’s your strategy? In the end, if the peels don’t come off neatly, I try to accept it as one of life’s minor imperfections, or I make egg salad. How to Soft-Boil Eggs: Put 1/2 an inch of water in a medium pot with a lid and bring to a boil. Use a spoon to gently lower eggs into the water (they will only be partially submerged, of course), replace the lid, and set your timer for 7 minutes. Rinse the eggs immediately in cold water for at least 30 seconds before peeling. This method is adapted from Cooks Illustrated (they recommend a 6 1/2 minute cooking time), and reading about their extraordinary effort in developing it was quite enjoyable. Pick up a print copy of most recent issue for the full story; it’s worth the price of the magazine. This method is genius because of the speed; it doesn’t take long to boil a 1/2″ of water. And p.s! I’ve loved posting recipes here daily for most of the past year. Aside from how well we’ve eaten with all that cooking, the writing has been a little haven for me: an hour a day, alone, in silence (this is an indulgence to make any parent of three little people swoon). In the coming year, I’ll be posting less, and hopefully responding to comments more. I am so grateful for the many friendships, kindred palates, and cooking inspiration I’ve unexpectedly found here. Thanks for reading and sharing this space with me! This entry was posted in Breakfast, Eggs, Food, Recipes and tagged eggs, hard boiled eggs, soft boiled eggs on January 5, 2013 by emmycooks. Yay! I am so glad you’re back! Here’s to a wonderful new year! This looks so good! I really love eggs and toast. Happy New Year to you! Happy New Year to you! And congratulations on your blog anniversary! Eggs are divine, and the simpler the better. After looking at your photo I know what I’m making for breakfast in the morning. I love Cook’s Illustrated and all they share in testing recipes – I’ll definitely pick up the issue to read more. Wishing you a delicious 2013! Post less? ;-) Good to have you back! Congratulations on your blog anniversary. I add a tablespoon of vinegar to the boiling water to help make peeling very fresh eggs easier. Yum! Soft boiled eggs are so delicious and weirdly fancy looking! Glad you’re back! Nice looking egg. I don’t know how you manage to post once a day. I struggle with once a week. Thanks for the egg tips! Lunch today is covered! Think I might have to pick up a copy of that magazine, too. Funny that something so simple took me years to figure out in my own kitchen. 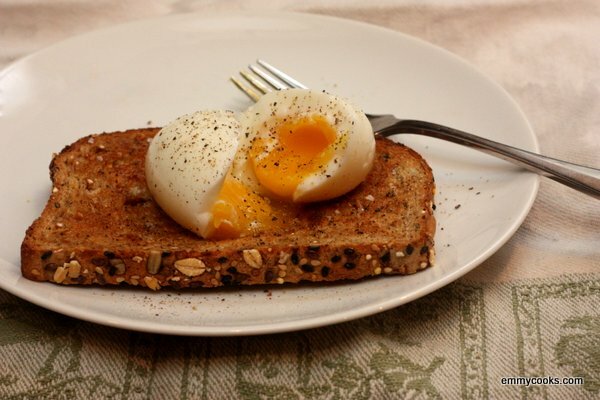 Alas, we don’t eat eggs anymore, but the soft boiled variety with toast fingers was my favorite! Emmy, first of all I’m glad you’re back too and happy to hear you had a great holiday. I look forward to more of your writing too. It is a haven for sure! Have you ever tried the method where you use vinegar in water and crack the egg right into the water to soft boil it? I did this my first time last year and it was scary to do but came out great. No special tips on peeling other than chilling the egg – as you mentioned – which helps the inside shrink back from the shell a little. My method for hard boiled eggs is a bit different. I put my eggs in cold water adding a bit of acid( lemon or lime juice ) just in case any of the shells have small cracks. I bring the water to a boil and turn down the heat for 12 minutes then quickly replace the boiling water with very cold. Mostly,I donT have a problem with the shell coming off using this method. I have so much I want to say: welcome back, I’ve missed you! and, happy anniversary! and, I don’t know how you managed to post daily for so long! I love your blog, Emmy, and it’s been a pleasure getting to know you over the past year. I’ve learned so much about good eating from you! Best wishes for the new year, and here’s to sharing many more recipes. Glad to see you back! Have you tried this one? After draining the water, put the lid back on the pan and shake well to crack the shells. Then run very cold water over. Works pretty well. Unless the eggs are super fresh—in which case I don’t think anything works. Jacques Pépin recommends leaving them in cold/iced water after cracking the shells to eliminate any sulfuric smells . . . Yes, I think so. He recommends boiling old eggs because they supposedly are easier to peel. Happy Blog Anniversary and Welcome Back!!!! That’s a lovely shot – real comfort food. Perfect after the excess of Christmas or just perfect any time. I thought you were kidding when I saw the title, but you actually describe two methods I had not seen before. I’ve found that size, freshness and temperature of eggs all play a role in how fast it will cook. I like the white firm and the yolk soft, and I don’t boil eggs often enough to get it right every time. Happy anniversary! I’ve loved keeping up with you over the past year and can’t believe it’s gone so quickly (for me, at least). A year, already! Someone in our house got a sous vide machine last year and talks frequently about sous-vide-ing eggs, but until that happens (i.e., that will never happen), soft boiling in 1/2″ water sounds like the way to go. Thanks! Welcome back, Emmy! And Happy New Year! I have to admit that I am positively crap at peeling eggs. The only thing that kind of works for me is to boil them and then leave them in the fridge overnight. Peel them the next day. The longer they stay in the fridge, the easier they are to peel. They don’t really last long in the fridge though. I eat them too quickly! That egg looks positively delectable. I agree that eggs can totally be a secret weapon in the kitchen. They are so versatile and easy. I’m also glad to be in good company with the decision to post a little less often in the new year. I can’t believe you’ve been able to post as often as you have, but I’d still come back even if you posted just once a month! Do you have to turn the eggs when you are doing the soft boil if you aren’t covering them all the way? So glad you got some time away, Emily! Sometimes a little recharge is needed, but it’s a blessing to have you back in action. I’m a sucker for ooey gooey yolks smeared over toast, and I wanted to chime in on the peeling issue. I recently tried adding a good spoonful of baking soda to the cooking water, and it seemed to help tremendously. Those eggs were pretty enough to be deviled! Happy new year and thanks for all the great posts. Your blog is one of my go tos when I’m looking for an interesting, delicious recipe that is easy to make in the home kitchen. I’m amazed how you were able to come up with a new dish almost every day. Nothing like a perfectly cooked soft egg! My mom used to make one for me served over torn bread pieces and stirred up in a small bowl with salt and pepper. I now make this for my little boy and he loves it. Thanks for sharing the classics! Such a simple yet fantastic post. Thanks for sharing!